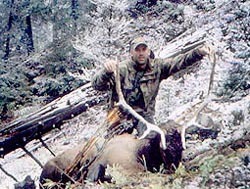 West Fork Outfitters - A top quality Colorado Outfitter and Guide. They offer trophy mule deer and elk hunts in Colorado?s unit 71. West Fork Outfitters (WFO) is a top quality Colorado Outfitter and Guide operating in the famed San Juan Mountains of southeastern Colorado. 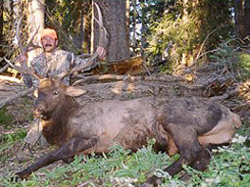 They offer fully guided mule deer and elk hunts out of a large and spacious hunting lodge. This lodge is set within the borders of unit 71 and is well situated to provide access to the surrounding forests lands. These forest areas hold a high population of elk and mule deer and this fact has allowed Michael and Jason Hall to develop and maintain a high success rate on quality animals. After a long day of hunting, WFO's guests are treated to a hot meal and a shower. And what could be better than climbing into a warm comfortable bed at the conclusion of a cold wet day. For those wishing to Go It Alone, West Fork Outfitters also operates several drop camp sites. Hunters and their gear are packed into fully equipped camps including wall tents, stoves, lanterns, cots and pads. From these camps, you will be able to enjoy a real hunting experience heading out each day on a true do-it-yourself hunting adventure. The only things that are required for these hunts are your own personal equipment and gear, your own food, and a desire for a wilderness experience. West Fork Outfitters will check on you every two to three days and will pack out any game you have taken. These are great hunts for those possessing the desire and experience to hunt without a guide but do not have the equipment or lack the horses used to access the backcountry. Whether you are looking to go fully guided or try a do-it-yourself drop camp, West Fork Outfitters has the services you are looking for. Check out their website at West Fork Outfitters or contact HuntersTrailhead for more details.